Great shot of George Scott on the works Matchless G45 at the Dutch TT at Assen. 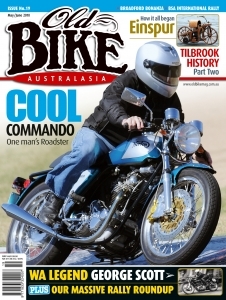 Gene Pitney once warbled, “East is east, and west is west, and never the twain shall meet.” For years, the maxim certainly applied to motorcycle sport in Western Australia, because until the advent of affordable air travel, racing interstate meant driving vast distances over primitive roads. 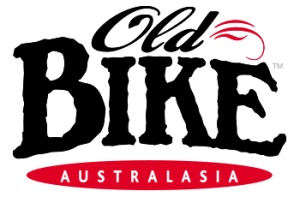 The remoteness of the WA motorcycling community from the eastern states action meant that home-grown heroes tended to remain legends in their own state, despite the fact that they could more than hold their own at any level of competition. Mention George Scott to any of the older brigade in WA and you will get the same reaction; George was the best all-rounder the state has ever produced. That’s a claim not to be taken lightly when you consider that Scott’s rivals included the likes of Peter Nicol who excelled on tar and dirt alike. Scott’s racing career covered almost 40 years, from the time he joined the AJS club in 1938 to his last race in 1976. Born on 28th February, 1923 at Collie, a mining and timber town south of Perth. He was the youngest in a family of four brothers and one sister. From 1937 to 1964, the Scott family lived in Caledonia Avenue, Maylands, coincidentally in the same street as two other famous WA sporting stars, boxer Snowy Clark and swimmer Evelyn de Lacey. George was besotted with motorcycles from an early age and became a mechanic, working with his brother Ted as soon as he left school. By the time he reached his seventeenth birthday and was eligible for a road licence, he was already an accomplished rider after pounding around the paddocks for several years on Ted’s Matchless. He camped outside the Traffic Office, waiting for the doors to open on his birthday, and after passing his test with ease, rode away on the KSS Velocette he and another brother, Fred had bought between them for ten pounds ($20). 23 days afterwards George made his competition debut, riding a 1000cc Brough Superior outfit with Ted in the sidecar in the 1940 Australian TT on the Albany street circuit. He had never ridden a sidecar until the pair set out on the Brough to cover the 500 kilometres to from Perth to Albany, on the southern-most tip of the state, traversing roads that were mere bush tracks in places. After placing fifth in the handicap event, the Brough blew the front head and barrel clear off the crankcase in the main TT! His first race meeting on a solo was at North Beach in October the same year, aboard a 250 cc DKW. After winning a handicap event at Yanchep, he fitted a sidecar to the DKW for the meeting at Applecross, but the strain of carting George and Ted was too much for the little engine, which expired in terminal fashion. When the war years came, George enlisted in the Australian Army, serving in mechanical workshops in WA and on islands in the Pacific. Upon his discharge he took a Rehabilitation Apprenticeship Course as a Motorcycle Mechanic, graduating with three other ex-servicemen as the first officially-trained motorcycle mechanics in WA. Fit and Fast. 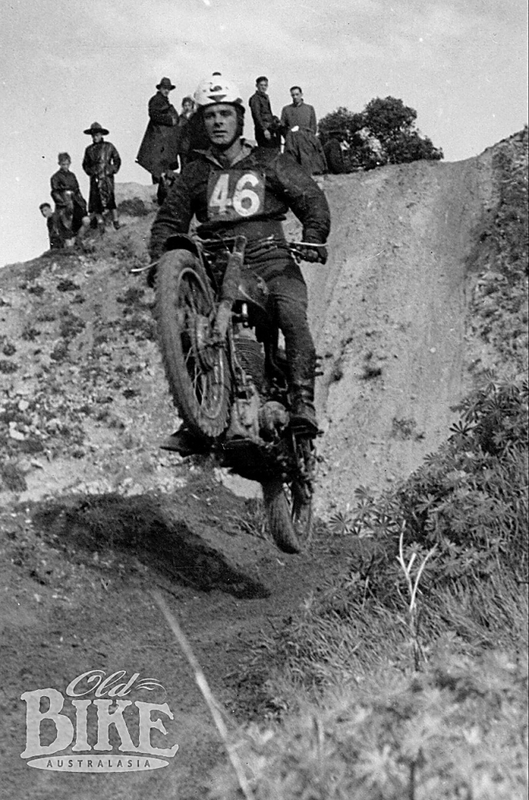 George leaps his 350 AJS to his first Hartley Scramble win in 1949. As soon as he was back in civvies, George obtained a 350cc 3T Triumph and threw himself into whatever competition he could find, on or off-road. The biggest and most prestigious event on the WA calendar was the Harley Scramble; not the usual sprint races but a two-part long-distance cross country bash over the formidable Ropeworks course at Mosman Park, nowadays one of Perth’s most exclusive suburbs. The 4-kilometre course was the most severe test of man and machine imaginable, winding its way up and down limestone cliffs and through a quarry. Many of the hills were so steep that ‘rope gangs’ were stationed at the top of the climb to haul stranded bikes to the summit and on their way again! Indeed, the Supplementary Regulations for the annual event stipulated that machines should have” a fitting on the front suitable for attaching a rope and hook”. 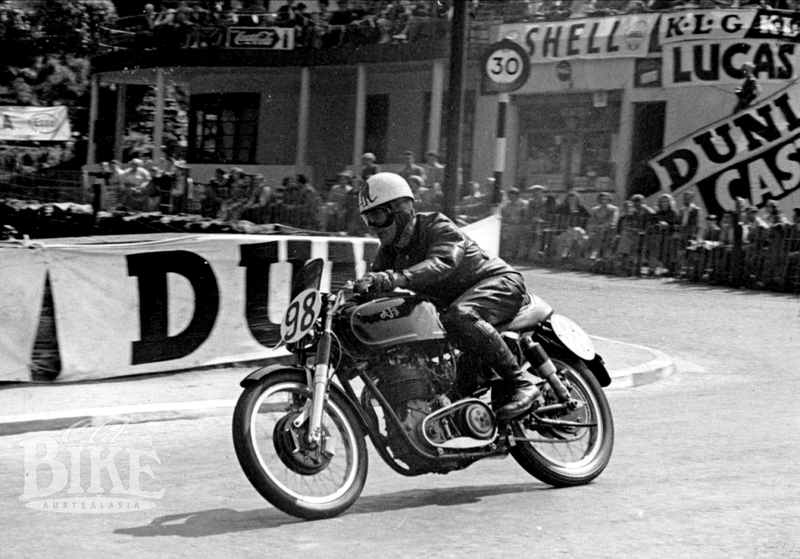 On his 3T Triumph in 1946 and 1947, and on a 350cc AJS in 1948, George worked his way into the lead, only to retire when the machines fell apart beneath him. But in 1949 his luck finally changed, winning on the AJS and doing it again the following year. After finishing second on a Triumph TR5 to Peter Nicol’s Royal Enfield in 1951, he took his third win on a 500 AJS in 1952. On each occasion, his machine was prepared by pre-war racer and mentor Jack Scott (no relation). Besides the scrambles events, George went road racing at every opportunity, including several trips to the annual Victorian TT held at Ballarat. It was here that he made the acquaintance of local star George Morrison, who rated young Scott so highly that he was quoted as saying, “George Scott, the boy from the west, rides as if on rails.” In 1950 the Australian TT, officially our national road racing championship, was allocated to Bunbury, WA on a twisty, bumpy round-the-houses circuit. Due partially to the Easter date which clashed with Bathurst’s annual carnival, interstate representation was thin, but Victorian Maurie Quincey was expected to be the class of the field. Scott, mounted on a 7R AJS, chased Quincey home in the 350 TT, and took third behind Quincey and fellow Victorian Joe Donovan in the 500TT. Two years later, Scott was selected to represent WA at the Australian TT held at Little River, outside Melbourne. With a new 7R AJS, he finished second behind the rising star from NSW Alan Boyle (who was killed just a few weeks later at Orange, NSW) and notably ahead of the favourite, Quincey, in the 350 TT. Aboard a new Grand Prix Triumph, Scott amazed everyone by shooting into the lead of the 500TT, only to have the magneto fail. With the sparks returned, he finished third in the Unlimited behind Quincey’s new 500 Manx Norton and Jack Ehret’s 1000cc Vincent Black Lightning. 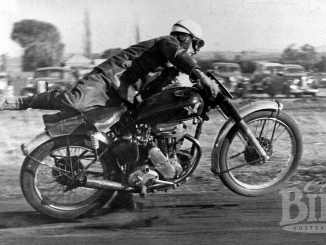 George had few serious falls, but one worth mentioning occurred at the Goldfields TT on the Boulder Rock circuit in 1949. On his GP Triumph, Scott was under intense pressure from Harry Gibson’s 1000 cc Vincent, and in attempting to make up time on the corners, overshot a bend in the mining area of the track. Heading towards a wire rope barrier at neck height, he laid the bike down speedway style and slid underneath into a 6-metre deep, unused gold mine shaft/drainage hole, full of discarded rubbish. As George scrambled to get out, Ray Lawler repeated the feat, landing on top of him. Both men managed to clamber out, covered in filth, but unhurt. The Triumph however, was wrecked, the frame beyond repair. Consequently George’s old 3T frame was modified to take the GP engine, along with the GP’s sprung hub and 8-inch front brake. Only days before departing for England on the liner “Himalaya”, George married his fiance June, their honeymoon being spent aboard ship. Also travelling on the same ship was speedway star Chum Taylor and his wife Dulcie. His WA employer, Merv Brooking of Westralian Motorcycles, the AJS, Triumph and Vincent agents, arranged for George to collect a new 7R AJS from the factory at Woolwich in London. However the machine had not been built when George arrived, so he spent his time working on the production line assembling road-going AJSs. NSW rider Ernie Ring had been in England for over 12 months, and was now supported by the AMC (AJS and Matchless) factory, primarily to develop their 500cc pushrod-twin G45 Matchless racer, and the works OHC AJS ‘Porcupine’ twin. Ernie enlisted George to help with the testing, which was primarily carried out at the Snetterton circuit north of London. As soon as his new 7R was ready, George and June set out for the Isle of Man. In the weeks preceding the TT races, George clocked up over 3,000 kilometres on an Matchless road bike loaned by the factory, but then embarrassed himself on the first lap of official practice by dropping the model at the slowest corner of the circuit, Governor’s Bridge. He was in good company, for he virtually landed at the feet of NSW rider Tony McAlpine, who had slid off his Norton minutes earlier! In the seven-lap 420 kilometre 350cc TT, George drew 98th starting position in the ballot from a field of 106 and came home 3 hours and 11 minutes later in a very creditable 14th place, having averaged 82.4 mph (132.7 km/h) including a refuelling stop. 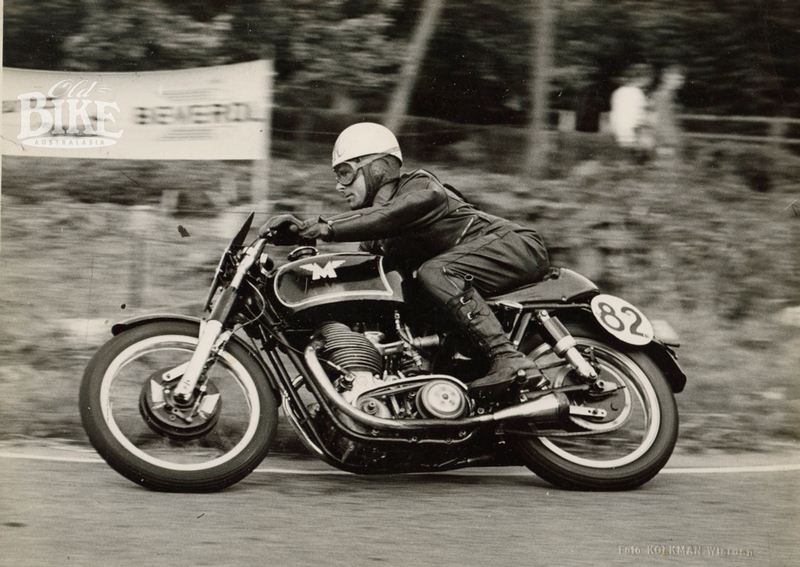 Three days later George faced the starter for the Senior 500cc TT, riding the same 350cc AJS. He finished 23rd in a time almost identical to the 350 race, with the AJS engine getting rather tired – not surprising since it had covered a total of 28 practice and racing laps, or 1,700 kilometres, without even removing the cylinder head. Teaming up with Ernie Ring, the Scotts set out for the Continent, racing at Solitude, near Stuttgart, before heading to Assen for the Dutch TT. 1953 marked the final year that the original 16.4 kilometre tree-lined road circuit, which incorporated cobblestone sections, was used. A valve grind restored some of the 7R’s edge, and George came home 9th in the 350 TT, the second private owner. Then it was on to the Belgian GP on the super-fast 14 kilometre Spa-Francorchamps track, where he finished 11th in the 350 GP, again the second private runner. But tragedy struck in the 500GP when Ernie Ring, riding the works AJS ‘Porcupine’, was killed in a bizarre accident. After a massive slide which took him off the road, Ernie was straightening up before returning to the circuit when his head struck and overhanging tree branch with fatal consequences. George, and the large Anzac contingent, was devastated, but with money in short supply, he had little option but to continue racing in the events for which his entry had been accepted. George Scott rounds Quarter Bridge on his new 7R AJS in the 1953 Junior TT. The AMC factory agreed to loan him Ring’s G45 Matchless, which meant he could now start in both 350 and 500cc races. Heading to Germany, he amazed everyone by setting fastest 500 time in the non-championship Nurburgring race. He retired with clutch trouble in the race but finished third in the 350 event. One week later, the GP regulars were at Schotten for the German GP. The concrete-surfaced 16-kilometre circuit was slippery enough when dry, but unrideable in the wet, and all works 350 and 500cc riders refused to start. However the impecunious privateers had no option but to race for their financial survival, although the 350 and 500 events were stripped of their World Championship status. George finished 4th on the AJS, but was lucky to survive a high-speed brush with the roadside trees on the 500. Worse was to come. At Tubbergen in Holland, George had pushed the unfancied Matchless into second place on the final lap of the 500cc race. Attempting to pass fellow Aussie and future 350cc World Champion Keith Campbell, he lost the back end (which was coated in oil from a split oil tank) and crashed heavily, knocking himself unconscious. Trackside marshals reported to the Race Control that George was dead, and an announcement to this effect was made over the public address system in the pits at the opposite end of the 12-kilometre circuit, sending his wife June into a state of shock. Meanwhile, a doctor had been despatched to the crash scene, where he found Scott, although badly bruised and sore, had recovered consciousness and was otherwise unharmed. Loading him into his car, the doctor drove back to the start, where Scott was able to walk into the pits unaided, much to the relief of his wife. Although he had not broken any bones, George was fairly knocked around, and this spelled the end of his European season, meaning that he missed the Swiss and Italian Grands Prix, for which his entry had been accepted. The completely wrecked Matchless was delivered back to the factory in London (in three pieces), along with the 350 AJS, which was overhauled and shipped to Perth. Although he had been offered assistance by the AMC factory to return to Europe for 1954, George stayed at home, returning to his local status as the man to beat. World 500cc Champion Geoff Duke arrived in Perth to begin his Australian tour in January 1955, his first start being at the crumbling remains of the wartime airstrip at Mooliabeenie on a day when temperatures reached 40 degrees. On his old 3T Triumph, fitted with the engine from the Grand Prix Triumph, Scott chased Duke hard in the 500cc race until the bike jammed in third gear. With this rectified, he finished second to the maestro in the Unlimited, prompting Duke to remark that whenever he looked around to check the opposition, he could see “two beady determined eyes staring at me”. Dutch TT 1953. 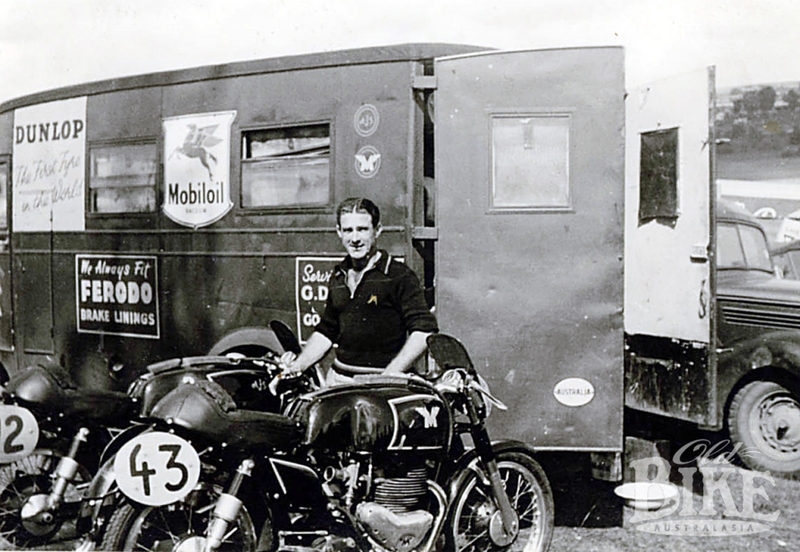 George Scott with the van he shared with Ernie Ring, and the experimental Matchless G45 in the foreground. By the time the Australian TT came back to Bunbury in 1962, George was pushing 40, but lined up on a race-kitted 125cc Honda and won an admittedly thinly-supported event. In the 250 TT, he placed third on the same Honda. One year later he made his last interstate trip to compete in the Australian TT at Lakeside, Queensland, on the same road-based Honda. By now the 125 ranks were swelled with the new CR93 production racers, and in practice George’s hopes took a further dive when he trashed the race-kit twin-carb cylinder head and was forced to fit the original single-carb head for the race. Nonetheless George held the lead until the drag for the finish line, when he was edged out by John Bauskis’ CR93. He continued to race various 125 and 250 Yamahas until he finally hung up his helmet in 1976. His working career from 1961 until his retirement in 1985 was spent with as Service Manager at Ken George’s Yamaha Dealership (Ken had been George’s CO during the war) at Victoria Park. George Scott passed away on October 19, 2002. More than 320 people filled a chapel at Karrakatta for the funeral of the man that many regarded as the west’s most versatile rider – a humble achiever whose entire life revolved around motorcycles and motorcycle racing. Footnote: George’s 1953 TT AJS 7R was subsequently raced back in WA by George himself and Dave Fletcher. 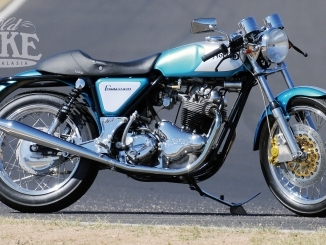 It was progressively owned by Noel Simmons, Des Phillips and Neil Earl, and is now owned by Paul Hemsworth in NSW, who is presently restoring the famous machine to original condition. Photos: OBA archives, Ken Duperouzel, Don Hall.